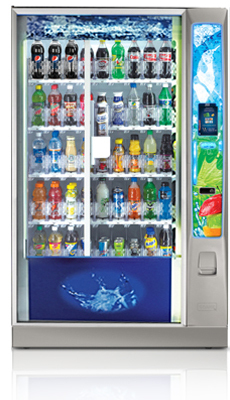 Allan’s Vending offers a variety of popular beverages to choose from including lots of healthy choices. The cold beverage vending industry is committed to reducing the beverage calories in the marketplace. To accomplish this goal, healthier portion sizes are offered and low calorie beverages. We still provide traditional Coke machines and Pepsi machines serving your favorite brands from Coke, Pepsi, 7UP, Snapple and bottled water, 100% juices, sports drinks, and energy drinks. We use only the highest quality, Energy Star Rated machines providing low down time and dependability. Allan’s Vending is here for your ice cold beverage needs.